When we hear the words Bespoke Automation, our minds usually turn to the image of machines running by themselves, with little human input. These machine churn out multiple items – each one exactly the same as the one before. Every once in a while the machine will emit a low, solemn beep, and the light on the machine turns to red, as it rejects a product that didn’t meet the stringent quality measures that the products are being checked to. Whilst this image isn’t incorrect in any way, there are other aspects of bespoke automation that you may never have thought of before. Bespoke automation has been proven to motivate workers. Not only do the machines make their life easier but it also increases what they can achieve in a day. With the ability to automatically generate live scoreboards from the data that the machine collects as it runs, your workers become motivated by seeing live results of their labours. Tie this to a reward scheme and it motivates staff beyond any other method. Find out more – How Do I Incentivise And Motivate Factory Staff Who Are Doing Repetitive Tasks? Repetitive strain injury risks are lowered when bespoke automation is installed. This is due to the fact that automation removes the need for human input to complete repetitive manual tasks. Not sure how high the risk of RSI is in your factory? Download our repetitive strain injury risk assessment form and find out now. Find out more – How Do I Prevent Repetitive Strain Injury In The Workplace? Improved throughput is another of the benefits of bespoke automation. Improved quality, increased accuracy, instant fault reporting, reduced downtime and improved traceability are just a few of the key factors that enable bespoke automation to improve throughput. Find out more – How Can I Improve The Throughput Capacity Of My Machinery? Productivity is boosted by bespoke automation as it increases efficiency, enables greater repeatability, improves product quality and allows for faster, more reliable production speeds. Find out more – What Impact Does Automation Have On The Working Environment? In the fast paced environment that we now live in, things are changing all the time. Products change: sizes, quantities, types, weights, material. With the breadth of knowledge and range of materials now available to us products evolve and change far quicker than they ever have done before. You may design a new product and then find that due to the fast pace of product development, in less than a year, you need to alter or change your product in some way to keep abreast of market developments. This can have its challenges as we all know! Production processes have to change, packing processes have to change, and production speeds may well have to change as well. All this has cost implications which have to be weighed up against the enhanced value of the new product to decide if the change is financially viable. Here’s the good news! We have developed the World’s Best Palletiser. It’s as flexible and adaptable as your production process needs to be to keep up with market demands. If your product size increases, a quick touch of the button and the palletiser is ready to go. If you want to stack more products per pallet, another quick touch of the button and it’s ready to go. There has never before been so much adaptability in a palletising system. What if I stop making a product you ask… We’ve considered for that as well. Simply unbolt the palletiser and use your forklift to transfer the system to another production process in your factory. In less than a day the palletising system will be up and running on your new line, leaving nothing in the old location other than 4 bolt holes where the robot was once bolted to the floor. Still not sure about all this? Then try before you buy. We’ve developed our try before you buy scheme to give you the opportunity to see how your product would work on the GA15 palletising series before you commit to investing capital in the system. There’s two ways of doing this, either send us your product to try on the palletiser before you buy, or visit Granta with your product to see how it works on the palletiser. Want to book up your free trial? Let us know at helpline@granta-automation.co.uk or give us a call on 01223 499488. In the world of manufacturing, the thought of changing from one method of working to something new can raise a number of concerns. Businesses become reliant on established procedures, even if they know they could be improved by implementing new ideas. That is certainly the case for many when it comes to the idea of installing automation. There are a number of misconceptions about automation and the way it will impact manufacturing operations. From loss of jobs to the financial implications, it can make some business owners cautious about investing in automation. However, once installed, they quickly discover that the reality of the technology is vastly different to their original expectations. We cover the main concerns held by business owners below whilst highlighting the positive ways it will add value to your production process. One of the main worries attached to the installation of automation is that it will lead to mass unemployment as robots take the place of humans. Automation is designed to make processes more efficient, while also improving the customer’s experience in terms of product quality and delivery times. It also means human workers can move away from working on repetitive, laborious jobs that do not make use of their full skill sets, into other job roles within the company. This benefits both the staff and the business as a whole. Other areas of the company that require human input will then be able to use the skills of the workers who are no longer tied to menial tasks. While there may be some initial loss of jobs after the implementation of automation, new jobs and opportunities are created in other departments due to the growth of the business sustained from the use of the technology. Whilst it’s true that businesses have to ensure they can afford the initial down payment for an automated system, increasingly there are more flexible payment packages available to help make it less of a financial burden. When looking into investing in automation, the long-term financial savings it will offer the business must always be taken into consideration. Automated technology can work longer and faster than human staff, with no shift times to adhere to. Machines also won’t fall sick, book holidays or take lunch breaks. The throughput within any facility instantly increases, improving efficiency, profit and allowing automation to eventually pay for itself. Using a comprehensive Automation Payback Calculator to accurately calculate the project payback is important as this will give you a true picture of the return on investment and enable you to see if it is a worthwhile investment for your company. Any reputable automation company will also be able to offer you finance on your automation purchase, enabling you to spread the cost out over a longer period of time. An ongoing issue bring raised within the manufacturing sector is the lack of available staff with specialised skills. When automation is installed into a new facility, there will also be a requirement to have it programmed and managed on an ongoing basis. This ties into the idea of job creation and new opportunities being developed for workers. Using an automation company to arrange the existing installation and programming will ensure it can be up and running in a short space of time. They can then hand over to existing employees who are able to learn and undergo further training to ensure the machines continue to operate effectively. However, with the development of technology, automation systems are now becoming more user friendly, and some automation systems now come with programming software that can be programmed quickly and easily in-house, without the need to undergo extensive training. This gives you increased in-house flexibility as you can then easily modify the system operation as your product or processes change, without the need to call in an automation expert to re-program your machine. By installing bespoke automation, companies are able to address specific issues within their manufacturing processes. There is a constant need to increase efficiency and automation provides that in any part of the production chain. In most cases it increases production throughput to at least 150% of a manual process. The use of automation technology, such as a production monitoring system, allows businesses to get a clear and up-to-the-minute view of what is happening on the production line. Some Production Managers have even commented that it allowed them to exceed target expectations by 40% only 3 months after installation. This insightful data helps to pinpoint bottlenecks to ensure production remains seamless at all times. Due to the repetitive nature of many manual tasks on a production line, businesses tend to suffer a high number of repetitive strain injuries to staff members. Repetitive strain injuries can lead to long layoffs which can prove to be costly. The use of automation, such as robotic palletising, improves production rates and removes the need for employees to repeatedly perform tasks that could lead to injury. Palletising also improves stacking quality and makes the working environment much safer for all staff. Manufacturing facilities constantly need to find ways of lowering costs while sustaining quality of product. Automation allows businesses to reduce labour costs without compromising the standard of the items being produced. One machine can perform the task of a number of workers, while never falling sick, taking time off or requiring lunch breaks, making production even more cost effective. Automation of quality control processes also reduces production costs as it eliminates the risk of human error in detecting faulty parts and products. Automated inspection processes ensure that faulty parts and products are rejected before reaching despatch. There is naturally a concern that automation will replace human workers, leading to mass unemployment. However, there has been research to show that is far from the case. Workers no longer have to do boring, repetitive tasks. The technology improves profits and allows businesses to expand, creating new job opportunities elsewhere that allows workers to learn new skills that will benefit the company as a whole. Usually if you put automation alongside a person, rather than replacing the person, you can improve the output more than enough to justify the project in it’s own right. Project justification rarely needs head count to reduce to justify it as the increased and better quality throughput usually self-justifies the project. In conclusion, whilst there will always be many different aspects to consider when investigating the case for installing automation in your business, if you have used a comprehensive Automation Payback Calculator to accurately calculate the project payback, you will be able to quickly see if there is a business case for investment. Does Automation Really Wreck People’s Lives and Cause Unemployment? How does Automation Affect Productivity? 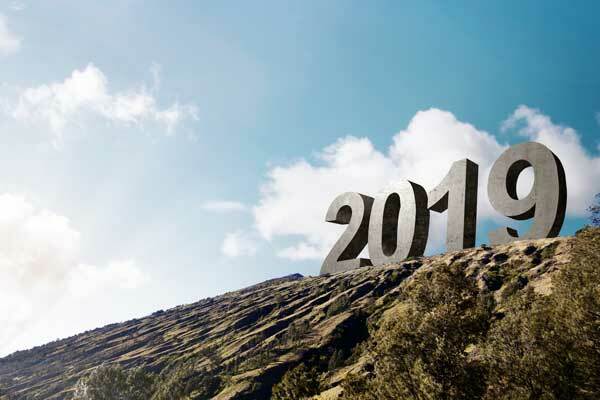 We’re looking forward to working with our customers in 2019 to help them Achieve with Automation. We help our customers achieve with automation by designing, prototyping, building and installing bespoke automation and robotic systems. All of our machinery is special purpose and we develop and manufacture custom solutions to automate manufacturing processes; from small control panels and machines through to complete robotic production lines. If you’re unsure what the best type of automation is for you then just contact us on 01223 499488 and we’ll be glad to help. 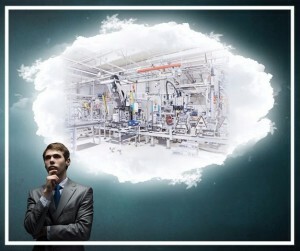 What Are The Benefits of Production Automation? Posted in Bespoke Automation, Custom Automation, Custom Machinery Automation, Robotic Automation	| Tagged bespoke automation, granta automation	| Comments Off on We’re looking forward to helping our customers Achieve with Automation in 2019! This informative video will give you a brief overview of what we do at Granta Automation and how we manage our processes to ensure the success of your automation project. Posted in Company news, Granta Updates	| Tagged Automation Company., granta automation	| Comments Off on Granta Automation – What Do We Do? 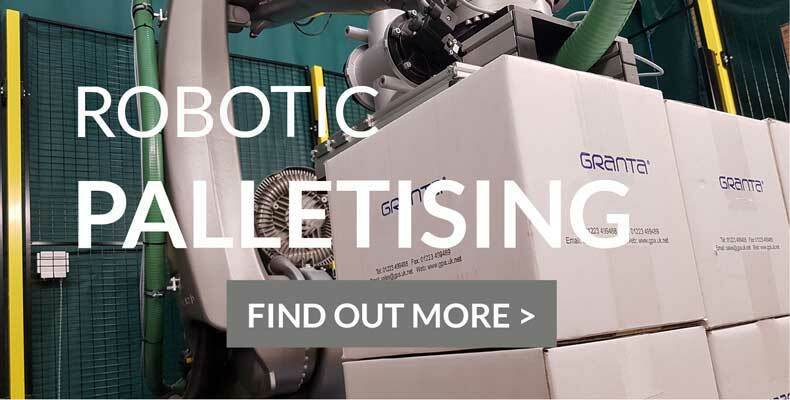 Watch a Granta Bag Palletising Robot In Action! 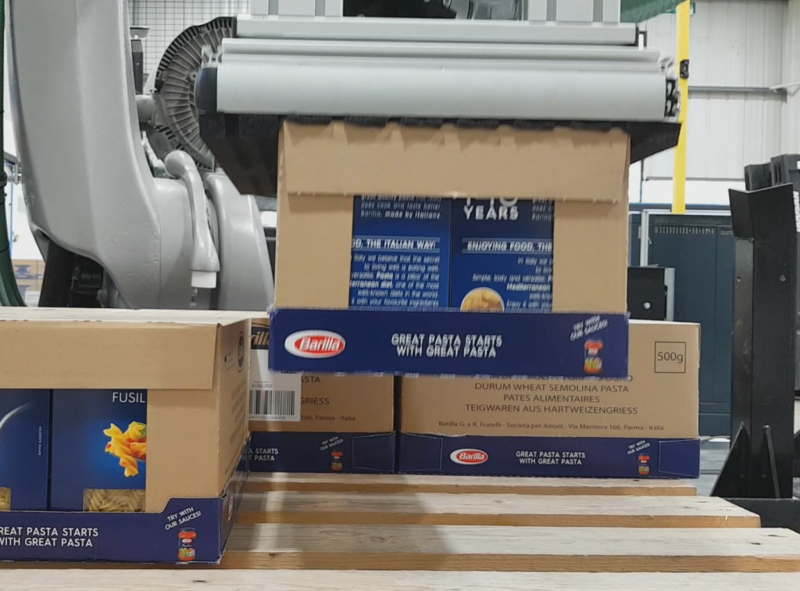 This video of a Bag Palletising Robot from Granta will give you an idea of what Automated Bag Palletising looks like in action! More information on our Robotic Palletising Systems is available here. Why does Automation Enable a Factory to Reduce Production Costs? How Can I Improve The Throughput Capacity Of My Machinery? Posted in Robotic Palletising	| Tagged palletising, robotic bag palletising	| Comments Off on Watch a Granta Bag Palletising Robot In Action! Every day in the UK there are millions of pallets being stacked with a wide variety of products. Estimates suggest that as much as 50-60% of this process is undertaken by hand. This is yet another reflection of how far behind the UK currently is in terms of adopting automation and robotics, and in many cases people are unaware of the current technologies available that could add tangible benefits to their business. To help you get a clearer understanding, we have put together this article as an introduction to automated pallet stacking and the key things to consider if you are thinking about investing in automation. Palletising is the process of placing or stacking goods onto a pallet or pallets. Over the years palletising has developed from being entirely reliant on manual labour, to the introduction of automated machinery to place products onto pallets in preparation for their despatch. Efficient palletising of products is an essential part of the supply chain as it ensures the production process is leaner and more efficient. Automated palletising systems can also be designed to include the dispensing of slip sheets onto the pallet, either in-between the various product layers, or on top of the finished load. Automatic pallet feeding can also be included in a robotic palletising system. Automated pallet feeding works in tandem with the production to keep the production line running continuously. What are the advantages of automated pallet stacking? Less downtime – The palletising process can continue for as long as needed, without requiring any breaks as with manual staff. Lower health and safety risks – Staff members are removed from potentially risky jobs that can lead to repetitive strain injuries or other potential injuries. Higher staff morale – A traditionally labour intensive job is removed from the schedule which improves worker’s morale and work enjoyment. Faster production speed – With less downtime and more pallets stacked it will positively impact the overall speed of the entire production line. Better pallet stack alignment – Automated stacking ensures the goods are positioned accurately in the correct position, improving safety. Less product defects – Poor stacking can create imbalanced weight and damage to both pallets and products which automated stacking avoids. Multiple solutions – One automated pallet stacking system can be used on a range of product lines regardless of their size, shape and dimension. Click here to download our excel payback calculator with typical payback calculations, enter your full production details to see what the payback could be for you. Product dimensions can frequently change along with the size of the pallets required to carry them which means that automated palletising systems have to be re-programmed at a cost. To avoid lengthy delays and expensive re-programming costs, invest in an automated pallet stacking system that can be re-programmed quickly and easily without you having to call in an external engineer on every occasion. One of the advantages of installing an automatic pallet stacking machine is it will reduce production time but this needs to be monitored carefully. Whilst it will always be faster than one person doing the job, it may not be more efficient than two or three workers. Take this into consideration when assessing how it will impact the production line and facility resources. The gripper used on an automatic pallet stacking machine is one of the most important elements to consider. 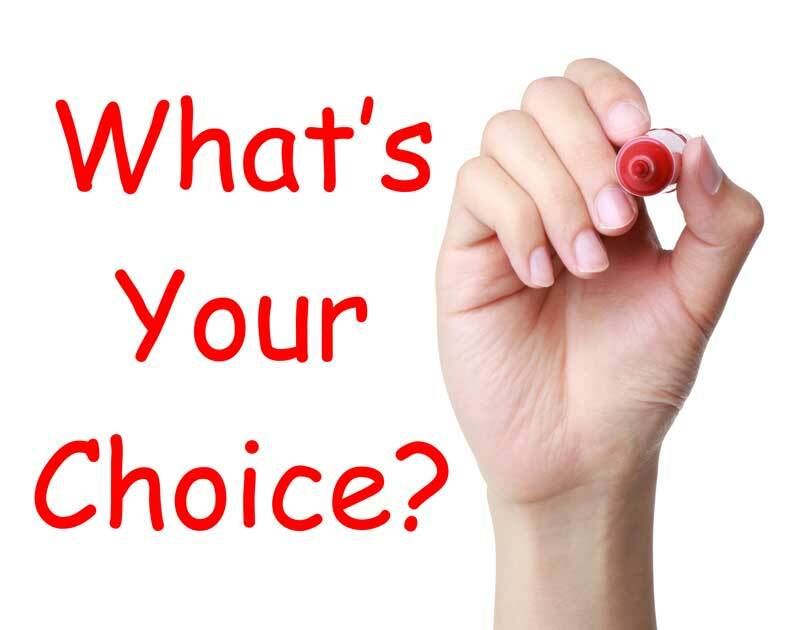 Choosing the wrong one can have significantly bad consequences for your product as the wrong fit could damage the goods. Test the product with the gripper before buying and rolling it out across the entire production. Book a FREE trial of your product on a Granta palletiser today. If you are stacking products in bags onto pallets, this may lead to poor stacking quality when it is done automatically. The way to avoid this is to work with a system that allows you to pre-prepare the product. This means when it comes to being stacked by the automated process it is done correctly without any damage being caused to the pallet or the product. To avoid an extended period of time between the changeover of products where cycle time is critical, make sure the system is fully automated with automatic pallet feeding. Introducing automatic pallet stacking into your facility will dramatically improve the efficiency of your production line thanks to the many benefits it brings. In the vast majority of cases this can be felt with immediate effect, ensuring you see a tangible return on investment which enables you to recoup your outlay in a relatively short space of time. Whilst there can be some initial challenges to overcome, this can be effectively managed by choosing a specialist automation company that will work with you to find a solution that matches your needs. Try your products on a palletiser for FREE, book now! How Do I Prevent Repetitive Strain Injury In The Workplace? Quality control in a manufacturing environment is one of the most vital areas of the production process and its value can never be underestimated. Manually inspecting products is still a popular choice for many companies today and while it has some advantages, the downsides can prove to be hugely problematic. In most cases this is due to mental fatigue of staff whose concentration levels naturally decline after an hour or two. The question is, why does this happen and what can be done to rectify it? Our blog digs a little deeper to find out more about the study of human concentration, the history behind a term referred to in psychology as vigilance decrement, and how it affects the manufacturing process. The term vigilance is used in the context of sustained concentration, meaning being able to sustain concentrated attention for long periods of time. A study focused on human vigilance was conducted during the Second World War by Norman Mackworth, a renowned British psychologist and cognitive scientist. His 1948 paper ‘The breakdown of vigilance during prolonged visual search’ has since gone on to become the most influential publication about human vigilance. His study was centred on the mistakes made by radar and sonar operators towards the end of their shifts. To understand why this occurred he used a test method that eventually became known as the Mackworth Clock. He discovered that operators experienced a decline in signal detection the longer they were asked to concentrate, an event now referred to as vigilance decrement. Those who took part in the experiments were noted as losing between 10-15% of their concentration ability within the first 30 minutes of a two-hour period, and it continued to gradually decline over the remaining 90 minutes. Graphs showing the downs and ups of vigilance. The vigilance decrement as a decline in signal detection over time or an increase in response time to correct detections over time. How might vigilance decrement affect your business? 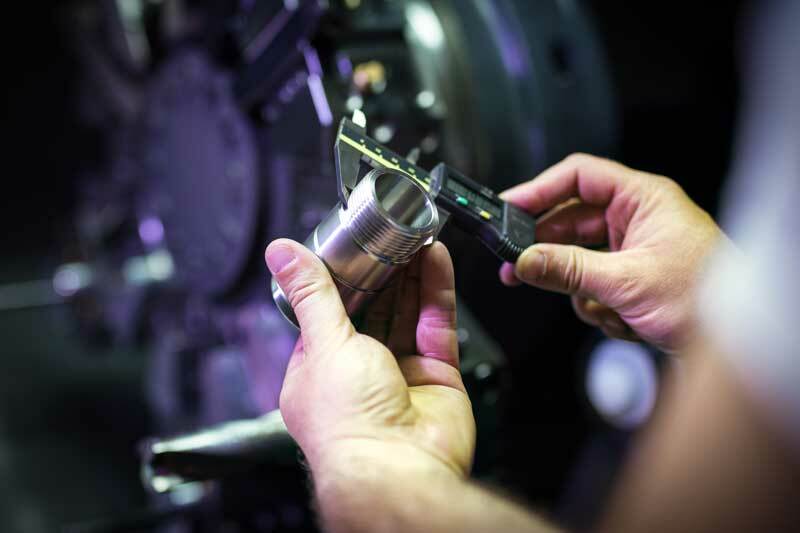 Even in today’s technologically advanced manufacturing world there are still a large number of companies who rely on traditional manual methods in their factories. This is particularly true when talking about product inspection and quality control. Sometimes it may simply be a case of preference, or lack of budget. In many cases it is believed that manual quality control is the most accurate way to ensure goods are made to standard, with a premium price often paid to keep this manual process in place. Norman Mackworth’s study on vigilance decrement focused on radar and sonar operators but the idea is transferable to any activity requiring long periods of concentration. In an age where mobile phones and digital devices are touted as being responsible for our shortening attention span, the results of Mackworth’s research is possibly more relevant than ever. Staff members who are given the task of manual quality control will naturally experience a fall in levels of concentration the longer they are doing it. This will invariably mean quality control standards will also dip during this same period, allowing sub-par products to slip through the net. There is still a chance these mistakes can be identified before the goods reach consumers, but if not, this could lead to expensive returns and recalls and ultimately a loss in public confidence. What can you do to reduce the effects of vigilance decrement? The good news is you will be able to implement some measures that can help avoid some of the damaging aspects of vigilance decrement. What should be remembered though is that this will not eliminate the issue completely and will require close monitoring, intricate scheduling and potentially higher on-going costs. Regular staff breaks: Vigilance decrement increases the longer staff are performing the same task. Allowing adequate time for breaks to help their concentration to recover will ultimately help quality control standards. Staff rotation: Moving staff from one task to another throughout their shift will allow concentration levels and quality control to remain at higher levels. This will keep them refreshed and more attuned to the task. Enhanced lighting: Ensuring there is adequate lighting in areas where manual inspections take place will mean workers have full sight on the task at hand, without straining their eyes and missing important product failures. Implement pass/fail templates: Introducing a pass/fail template for the design of each product that can be quickly passed over the item as it passes through ensures each one meets the correct dimensions and standards. How do I eliminate the vigilance decrement effect? While there are ways to reduce the effects created by low levels of concentration during manual product inspections, it cannot be removed completely. Mistakes are an inherent part of our human make-up and while there are some positives to be gained from that in terms of learning from our errors, in a manufacturing environment it usually equates to loss of valuable time and money. This is where automated machinery holds a big advantage, inspecting products at a faster rate without being affected by vigilance decrement even after hours of repeating the same process. A perfect example would be vision inspection systems which are used to significantly improve quality control. These automated inspection systems use either standard 2D cameras or 3D laser line scanners. This enables manufacturers to check and read product labels, measure the size and shape of objects to ensure each one is at the correct dimension, inspect for marks or scratches and much more. Understanding which machine vision system is right for you may require a little assistance, but regardless of the scale of operation or type of product there is one available that will ensure your quality control is significantly improved. Why Use Vision Systems for Quality Control – What Are The Benefits? What Sort of Vision Inspection System do I Need? Our support contract schemes have been designed to work for you – they’re as bespoke as our automation solutions! Whether you need 24/7 support or just an annual maintenance visit, each contract can be tailored to suit your exact requirements. There are four different levels of support available and these are explained in detail in our brochure which is downloadable here. 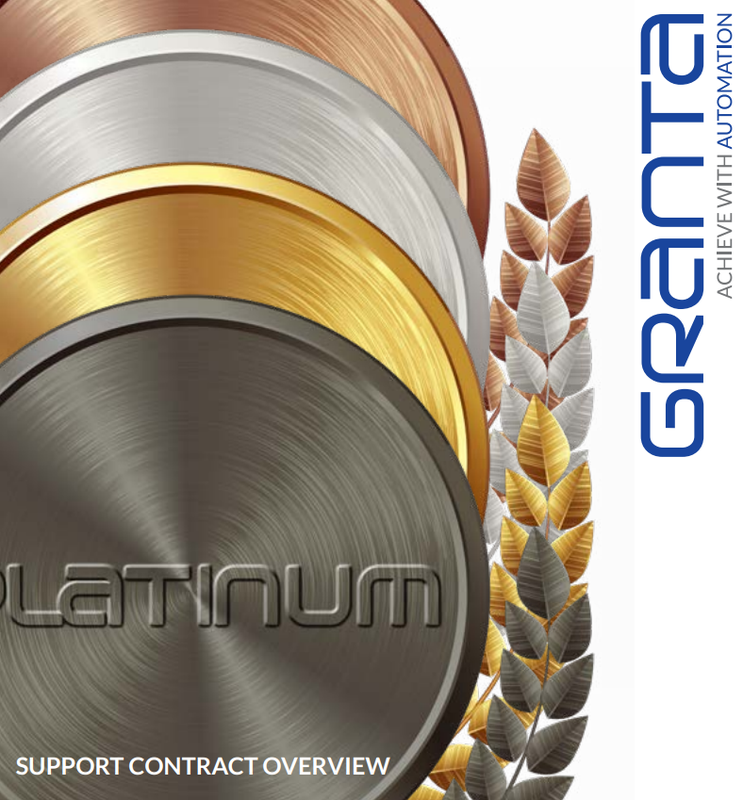 To discuss these contracts in more detail, contact us at helpline@granta-automation.co.uk, or 01223 499488.